This entry was posted on October 30, 2012 by frodosco. 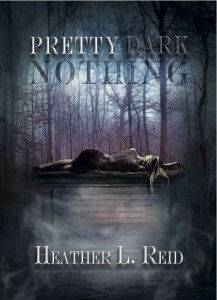 It was filed under Waiting On Wednesday and was tagged with Breaking The Spine, Demons, Fantasy, Heather Reid, Paranormal, Pretty Dark Nothing, Waiting On Wednesday, WoW. Wow…intriguing pick! Sounds kind of intense. Thanks for stopping by my WOW. Ooooh, I haven’t heard of this one but I like the sound of this one! Adding it to my to-read list! I’ve never heard of this one but it sounds interesting. Nice pick! I definitely love the gloomy/creepy cover. Thanks for sharing this one! It looks awesome. It seems demons are the new thing. Sounds creeeeeepy! Love the cover! Sounds interesting. Creepy but interesting. I’d love to read this one when it comes out. Thanks for sharing and for stopping by my WOW post.